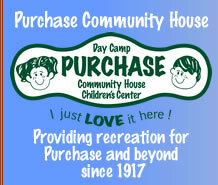 The Purchase Community House provides a drop-in center and afternoon classes for the children of Purchase and surrounding communities from mid-September through mid-May. To participate in the drop-in center or afternoon classes, an annual After School Program Membership fee must be paid. An Emergency Contact Form and Release Form is also required for each family. Those forms can now be submitted automatically while signing up for Membership online. Once the After School Program Membership fee is paid, the child's name is added to our sign-in list. Each child is required to sign in and out each day. Exciting Afternoon Classes ranging from sports to crafts to cooking and more are offered in Fall, Winter and Spring Terms of 7 sessions each for an additional fee. Descriptions of the current term's classes are listed below. Registration for classes and drop-in is accepted in person at the Purchase Community House on or after the opening registration date for each term. Parents are responsible for arranging their child's transportation to and from the Purchase Community House after school. Bus transportation is available after school for students from the Purchase Elementary School to the Purchase Community House for a fee. For the 2018-2019 school year, the Purchase Community House will be managing the transportation including registration, daily attendance and fees. The Purchase Community House will provide a 24 passenger mini-bus for the approximately 145 days the PCH is open. You can find more information about the bus here. Registration for Spring Membership and After School Classes is now open. register for the entire school year and pay just $750. Receive a $500 Camp Discount if you register for the entire school year. payment schedule for the Membership Fee or Class Fees. Information about the Purchase School to PCH Bus can be found here. obtained prior to signing up for any after school classes. Spring Homework Club will end on Thursday, May 23, 2019. Winter Homework Club will end on Thursday, March 21, 2019. Kindergarten Scholars will begin on January 15 and conclude on March 19, 2019. Let's Get Messy will end on March 20, 2019 due to an earlier instructor absence. Join us for a new and exciting program, Worldwide Sports. This program will expose our young athletes to a variety of sports known around the world. Worldwide Sports will combine progressive skill instruction and age appropriate game play with an equal emphasis on fun, skills, and an understanding of the rules of the game. Each class your child will explore rugby, soccer, cricket and tennis games while promoting fitness and movement. All players will receive instruction from Experienced Coaches that are committed to the development of the young athlete. Inspire your child's love of art with Young Rembrandts! Learning to draw can be fun, especially when we create silly characters, funny expressions and drawing sequences that tell a joke! This delightful program combines Young Rembrandts' innovative, step-by-step drawing method with light-hearted subject matter that engages children, their sense of humor, and their vivid imaginations. Space is limited; sign up today! Ga-Ga Ball is a dynamic court game that is played in our very own GaGa Pit. The game combines dodging, striking, running and jumping with the object of hitting opponents with a ball below the knee while avoiding being hit. Homework Club is designed to assist children with their daily homework assignments. Supervised by our afterschool teachers, the program will meet Monday - Thursday from 3:30-4:30pm. Emphasis will be placed on spelling, organizational skills, attending to tasks, math concepts, vocabulary, library research, reading comprehension and developing study skills. All work will be based on each child's daily homework requirements. A snack and water will be provided. Becoming part of "The Club" will grant you access to our computers to log onto your Google Classroom account in order to complete assignments or surf the web for research for the next school project. The fee for unlimited use to "The Club" is $150 for grades 1-6. Homework Club will be in session only when classes are in session. Let's get messy and have fun with SLIME! We'll be making all varieties of slime such as Unicorn Slime, Fish in a Bag Slime, Glitter Slime and even Edible Jell-O Slime. The possibilities are endless so let's get messy in this class. In Picture Perfect we will be taking pictures and turning them into works of art such as puzzles, collages, journals, and more. Let's make great memories and treasure them for a lifetime. Let's spring into spring with Spring Treats! We'll be cooking a variety of spring looking delicious treats. Our cooking projects will consist of a Birds Nest made out of chocolate chow mein noodles, Flower Lollipops using lifesavers, Unicorn Cheesecake Dip and Rainbow Cloud Donuts. So Yummy! I can't wait for Spring Treats to arrive. Beginner Instructional Tennis offered to all ages. Classes will be taught by tennis expert Cathy Moore. Don't miss out on this fantastic class where your children are in a fun, low key, non-competitive atmosphere. Waffle cupcakes, cinnamon waffle sticks, snicker doodle waffles, popcorn M&M waffles, waffle pizza, PB&J waffle, Tie-Dye waffles, Chocolate chip waffles. The possibilities are endless at this Waffle Party! Swing batter batter batter SWING! We will play games outside on our Wiffle Ball field. Participants may hit off a tee or try to hit a fast pitch from one of our TEAM Members. Tap, Tap, Tap...Hammer, Hammer, Hammer you will in his class. Your child will be able to build great projects such as wooden tables, picture frames, and even wooden cars. With the help of our instructors your child will be a great helping hand around the house in no time.